Float High Performance Positioning Pads are a simple and effective intervention to help prevent and heal wounds, manage contractures, and reduce pain. Float positioning pads contain a malleable, high performance fluidized gel that can be readily shaped to off-load, support, or accommodate positioning of the body. Once molded, the versatile Float positioning pads contour to the anatomy to facilitate weight distribution and pressure redistribution. Float High Performance Positioning Pads can be used in wheelchairs, chairs, bed, and other surfaces to protect skin and increase comfort for your patients. Product Warranty: The PostureWorks warrants its products to be free from defects in workmanship for a period of twelve (12) months from date of purchase. 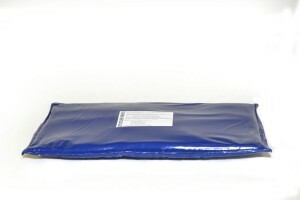 Thank you for choosing The PostureWorks Float High Performance Positioning Pad. Please familiarize yourself with the proper use and care of your new PostureWorks device. If you have questions, or need further assistance, please contact us toll free at 1-866-860-5200; a representative will personally assist you. ACCESSORIES: Hook and loop straps may be threaded through the slots on the Float cover to fasten the Float Positioning Pad to an armrest, backrest, or other surface. DO NOT USE STRAPS TO FASTEN THE FLOAT DIRECTLY TO A PERSON’S ANATOMY. Adhesive hook and loop may also be used to fasten the Float Positioning Pad to a flat surface. Cover: The Float cover may be removed from the bladder and laundered. Bladder: Flatten the Float bladder and clean with standard disinfectants. DO NOT LAUNDER THE BLADDER. DO NOT USE if bladder consistency changes or does not hold shape. DO NOT USE if bladder is punctured or leaking. WARRANTY: The Float High Performance Positioning Pads are warranted to be free from defects in materials and workmanship for a period of twelve (12) months from purchase under normal use.